Select Library of Nicene and Post-Nicene Fathers. The four books of St. Augustin On Christian Doctrine (De Doctrina Christiana, iv libri) are a compend of exegetical theology to guide the reader in the understanding and interpretation of the Sacred Scriptures, according to the analogy of faith. The first three books were written A.D. 397; the fourth was added 426. "Finding that the books on Christian Doctrine were not finished, I thought it better to complete them before passing on to the revision of others. Accordingly, I completed the third book, which had been written as far as the place where a quotation is made from the Gospel about the woman who took leaven and hid it in three measures of meal till the whole was leavened. (1) I added also the last book, and finished the whole work in four books [in the year 426]: the first three affording aids to the interpretation of Scripture, the last giving directions as to the mode of making known our interpretation. In the second book,(2) I made a mistake as to the authorship of the book commonly called the Wisdom of Solomon. 5. But if any one thinks that these stories are false, I do not strongly insist on them. For, as I am dealing with Christians who profess to understand the Scriptures without any directions from man (and if the fact be so, they boast of a real advantage, and one of no ordinary kind), they must surely grant that every one of us learnt his own language by hearing it constantly from childhood, and that any other language we have learnt, Greek, or Hebrew, or any of the rest, we have learnt either in the same way, by hearing it spoken, or from a human teacher. Now, then, suppose we advise all our brethren not to teach their children any of these things, because on the outpouring of the Holy Spirit the apostles immediately began to speak the language of every race; and warn every one who has not had a like experience that he need not consider himself a Christian, or may at least doubt whether he has yet received the Holy Spirit? No, no; rather let us put away false pride and learn whatever can be learnt from man; and let him who teaches another communicate what he has himself received without arrogance and without jealousy. And do not let us tempt Him in whom we have believed, lest, being ensnared by such wiles of the enemy and by our own perversity, we may even refuse to go to the churches to hear the gospel itself, or to read a book, or to listen to another reading or preaching, in the hope that we shall be carried up to the third heaven, "whether in the body or out of the body," as the apostle says,(1) and there hear unspeakable words, such as it is not lawful for man to utter, or see the Lord Jesus Christ and hear the gospel from His own lips rather than from those of men. The author divides his work into two parts, one relating to the discovery, the other to the expression, of the true sense of scripture. He shows that to discover the meaning we must attend both to things and to signs, as it is necessary to know what things we ought to teach to the christian people, and also the signs of these things, that is, where the knowledge of these things is to be sought. In this first book he treats of things, which he divides into three classes, things to be enjoyed, things to be used, and things which use and enjoy. The only object which ought to be enjoyed is the triune god, who is our highest good and our true happiness. We are prevented by our sins from enjoying god; and that our sins might be taken away, "the word was made flesh," our lord suffered, and died, and rose again, and ascended into heaven, taking to himself as his bride the church, in which we receive remission of our sins. And if our sins are remitted and our souls renewed by grace, we may await with hope the resurrection of the body to eternal glory; if not, we shall be raised to everlasting punishment. These matters relating to faith having been expounded, the author goes on to show that all objects, except god, are for use; for, though some of them may be loved, yet our love is not to rest in them, but to have reference to god. And we ourselves are not objects of enjoyment to god; he uses us, but for our own advantage. He then goes on to show that love the love of god for his own sake and the love of our neighbor for god's sake is the fulfillment and the end of all scripture. After adding a few words about hope, he shows, in conclusion, that faith, hope, and love are graces essentially necessary for him who would understand and explain aright the holy scriptures. Having completed his exposition of things, the author now proceeds to discuss the subject of signs. He first defines what a sign is, and shows that there are two classes of signs, the natural and the conventional. Of conventional signs (which are the only class here noticed), words are the most numerous and important, and are those with which the interpreter of scripture is chiefly concerned. The difficulties and obscurities of scripture spring chiefly from two sources, unknown and ambiguous signs. The present book deals only with unknown signs, the ambiguities of language being reserved for treatment in thenext book. The difficulty arising from ignorance of signs is to be removed bylearning the greek and hebrew languages, in which scripture is written, by comparing the various translations, and by attending to the context. In the interpretation of figurative expressions, knowledge of things is as necessary as knowledge of words; and the various sciences and arts of the heathen, so far as they are true and useful, may be turned to account in removing our ignorance of signs, whether these be direct or figurative. Whilst exposing the folly and futility of many heathen superstitions and practices, the author points out how all that is sound and useful in their science and philosophy may be turned to a christian use. And in conclusion, he shows the spirit in which it behoves us to address ourselves to the study and interpretation of the sacred books. The author, having discussed in the preceding book the method of dealing with unknown signs, goes on in this third book to treat of ambiguous signs. Such signs may be either direct or figurative. In the case of direct signs ambiguity may arise from the punctuation, the pronunciation, or the doubtful signification of the words, and is to be resolved by attention to the context, a comparison of translations, or a reference to the original tongue. In the case of figurative signs we need to guard against two mistakes: 1. The interpreting literal expressions figuratively; 2. The interpreting figurative expressions literally. The author lays down rules by which we may decide whether an expression is literal or figurative; the general rule being, that whatever can be shown to be in its literal sense inconsistent either with purity of life or correctness of doctrine must be taken figuratively. He then goes on to lay down rules for the interpretation of expressions which have been proved to be figurative; the general principle being, that no interpretation can be true which does not promote the love of god and the love of man. The author then proceeds to expound and illustrate the seven rules of tichonius the donatist, which he commends to the attention of the student of holy scripture. Passing to the second part of his work, that which treats of expression, the author premises that it is no part of his intention to write a treatise on the laws of rhetoric. These can be learned elsewhere, and ought not to be neglected, being indeed specially necessary for the christian teacher, whom it behoves to excel in eloquence and power of speech. After detailing with much care and minuteness the various qualities of an orator, he recommends the authors of the holy scriptures as the best models of eloquence, far excelling all others in the combination of eloquence with wisdom. He points out that perspicuity is the most essential quality of style, and ought to be cultivated with especial care by the teacher, as it is the main requisite for instruction, although other qualities are required for delighting and persuading the hearer. All these gifts are to be sought in earnest prayer from god, though we are not to forget to be zealous and diligent in study. 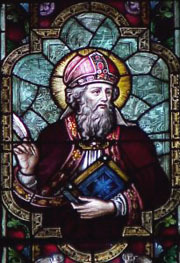 He shows that there are three species of style, the subdued, the elegant, and the majestic; the first serving for instruction, the second for praise, and the third for exhortation: and of each of these he gives examples, selected both from scripture and from early teachers of the church, cyprian and ambrose. He shows that these various styles may be mingled, and when and for what purposes they are mingled; and that they all have the same end in view, to bring home the truth to the hearer, so that he may understand it, hear it with gladness, and practise it in his life. Finally, he exhorts the christian teacher himself, pointing out the dignity and responsibility of the office he hold to lead a life in harmony with his own teaching, and to show a good example to all.